What is Google Remarketing? And Why is it so Effective? Have you ever felt like a certain ad was following you around the internet wherever you went? If so, you were likely being “remarketed” to. Google Ads is a great tool to get your business at the top of Google search results; however, what a lot of people don’t know is that Google Ads also offers the option of creating visual banner ads for your customers through the Google Display Network. Display Ads on the Google Display Network are utilized to attract new users to your website. In contrast, Remarketing allows you to select audiences that have already visited your website and provide them with more detailed offers, seen within the display network as they navigate the internet. Is it important to use one over the other? No, remarketing is actually a type of Display Ad, and they both operate on the Google Display Network. The major differentiator is that they both serve a different purpose. Moreover, they reinforce each other! If Display Ads are used as the first touch point with a website viewer, consider remarketing as the follow up. Leads gained from a remarketing campaign are often exposed to display ads or Google Ads campaigns earlier in the sales cycle. Google Display Network campaigns are different than standard Google Ads campaigns in that they give you an additional bidding option. Unlike traditional Google Ads ads that only allow you to bid on a Cost-Per-Click (CPC) system, the Display Network gives you the option to bid on a Cost-Per-Thousand Impression (CPM) system. This is in due part to the purpose of the Display Network. Many companies will use Display Ads on the Display Network for brand exposure, and are not as concerned about clicks, but repetition of ad exposure. Google Display Network also features a Display Ad builder that allows you to create ads from a variety of templates offering customizable text, colors, images, and logo. If you are without a creative team or simply lack design skills, this is a great alternative to designing ads from scratch. 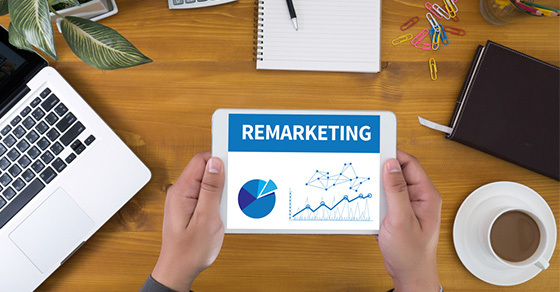 So what’s so special about remarketing? Remarketing advertisements are part of the Google Display Network. They allow you to serve ads to users that have already visited your website, or even a specific page, or event (like a button click). This opens up the door to target users who have shown a general interest in one of your products or services. Through remarketing ads, it is possible to create separate Display Ad campaigns based on whatever service or product the user has shown interest in. These Display Ad campaigns can then follow the user around as they navigate the internet. Any website they land on that is affiliated with the Google Display Network, has a chance to show your ads. This is done through Google’s remarketing cookie. Perhaps someone is researching a product, intends to buy it, but becomes distracted and puts off the purchase. How do you get that potential customer back? Serve remarketing ads! So how can you use both to your advantage? It’s important to use the two in unison to create a cohesive ad placement strategy. If your company receives a lot of traffic, remarketing is a great option as it will only reinforce all your other traffic driving efforts. If you’re not utilizing both options, it may be time to think about implementing both. Remarketing may work better for sites that have a lot of traffic already, but it can also be quite beneficial to lower traffic sites and pages, where each visit is that much more important! AdLuge tracks the effectiveness of all your online marketing efforts in one central dashboard. Paid placements, Phone-call tracking, social and referral lead tracking, and search engine ranking reports are all found within a central cloud-based application. AdLuge lets you see what’s working and what isn’t. You can try it out for 30-days free here. Of course, there are many other ways to remarket to your website users. AdRoll is a pioneer in the industry, while other companies like Acuity have recently emerged as competitive alternatives. Thanks for this article. I have noticed some ads following me around during my surfing sessions and while I knew that it’s part of Google’s ad network, I wasn’t aware of the different types of ads that are available, and the logic behind them. Thanks for clarifying this. I believe it can be very powerful to combine both and to invest in this type of advertising. Another great example of how micro-targeting has enabled marketers to home in on users’ specific interests and employ more efficient advertising. I also thought it was interesting that ads on external popular sites can be used to redirect users back, thus leveraging the success and marketing efforts of others. That’s true, I have noticed in the recent past that some ads, especially the ones that I clicked, kind of keep on following me everywhere that I go, and I often wondered what the heck was going on. Now I know why, It’s a brilliant plan I would say and that’s one thing that I love about Google, they are very ingenious.